The human-canine bond has a sad limitation. Dogs live for far less number of years than humans do. 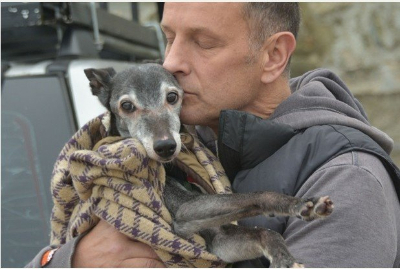 The time had come for Walnut, Mark’s best friend for 18 years, to be put out of his suffering. Mark decided to honor their special relationship by organizing a last walk to their favourite beach. 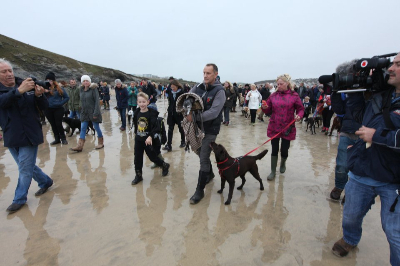 Hundreds of dog-owners and dogs joined Walnut on his last walk. Walnut was put down on Saturday. Mark Woods, resident of Newquay in southwest England, could not see the suffering of his old friend Walnut anymore. 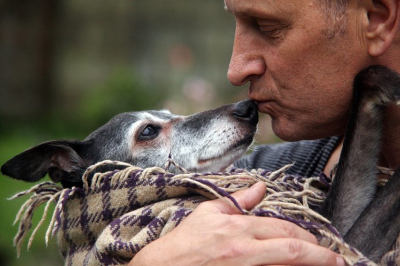 The dog, a whippet, had been with him for 18 years. But Walnut was struggling with severe illnesses of old age. Mark made the decision to put his beloved mate to final sleep. But before going to the vet to have Walnut put down, Woods decided to celebrate their long and special friendship by taking Walnut to his favourite beach for one last walk. 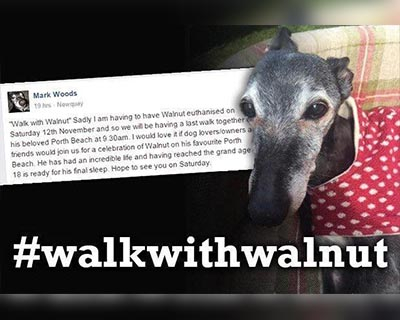 On November 8, he shared a call-out on Facebook, inviting people and their dogs to join Walnut for his last ever walk on the beach this Saturday at 9.30am. He wrote:"Walk with Walnut" Sadly I am having to have Walnut euthanised on Saturday 12th November and so we will be having a last walk together on his beloved Porth Beach at 9.30am. I would love it if dog lovers/owners and friends would join us for a celebration of Walnut on his favourite Porth Beach. 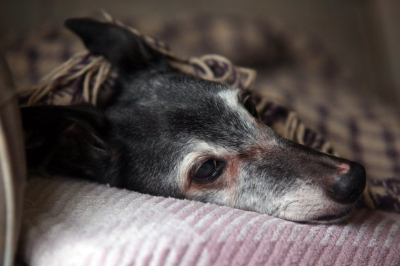 He has had an incredible life and having reached the grand age of 18 is ready for his final sleep. Hope to see you on Saturday. The response to his emotional call-out was overwhelming. Mark and Walnut’s heart-wrenching story captured the attention of not just the Newquay community, but the entire world. #walkwithwalnut was trending on Facebook. The story was shared thousands of times, and people from all over the world sent their support. Those who owned dogs understood the pain Mark was going through. Those who had ever lost a beloved dog wept. Mark even shared a photo of Walnut lying on his lap "replying to messages." That he had the support of thousands of people like him gave Mark strength to prepare for the inevitable. Note: Whippets are a sighthound (they hunt by sight and speed, rather than by scent) breed that originated in England, where they descended from greyhounds.They have a lifespan of 12-14 years. That Walnut had lived much longer was a tribute to the care Mark took of him till the very end. Why was this story sad but beautiful? Dogs, like humans, are mortal. Unlike humans, however, they live for just 10-14 years. In that sense, Walnut had lived his full life. While Mark could have tried to keep Walnut alive for a few more months, he understood that would have been a selfish decision. Walnut's health was deteriorating rapidly which was causing him to collapse regularly. Mark said in an interview, "He sleeps with me in bed and cries when I am not around. It is a desperate situation and not good." A comment on his post captured the merit in Mark’s decision aptly. It said that dogs depend completely on their owners for everything. So the owners must decide what is best for their pets. In this case, Walnut was suffering every day. The only logical ethical decision was to let Walnut go. It was sad, really sad. Eighteen years is a really long time to let go. Mark said, "He's been with me through some very difficult times in my life and he's just got me through them, both physically and mentally”. "We've shared a lot of dramas, a lot of fun and a lot of shenanigans and he's exceptionally special”. Despite Mark’s two marriages, many health issues and other problems, he had Walnut all the way through. The dog was the only constant companion he had. 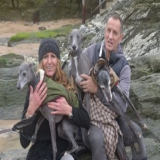 What made Mark’s decision beautiful was his determination to celebrate his 18 years with Walnut by taking him for a stroll on the same beach in Cornwall that they had walked all these years every morning. Even more beautiful was his call-out to other dog owners to join Walnut on his last walk. He had little idea how strongly his emotional call-out would resonate. Even as Facebook was being criticized for how it is misused by users by putting ‘fake news’, here was a beautifully real and really beautiful story that people got to know on Facebook. However, many of those who read this story were not going to stop just at liking, sharing and commenting on Facebook. When did the walk happen? Like he had announced, after feeding Walnut his favourite delicacies, Mark brought him to Porth Beach on Saturday morning, right at 9:30 am. Hundreds of people and even more dogs were waiting for Walnut. Some dog walkers had reportedly driven for up to four hours to attend the walk. Banners hung from many houses around the beach expressing love for Walnut and support for Mark. Walnut arrived covered in a chequered blanket to keep him warm. Walnut could not really walk. Ill health had taken away the walking ability of the dog that once could never stop running and jumping. So Mark carried his best friend in his arms and walked towards the sea. Many of those who were walking with Walnut touched and comforted him as if to wish him well for the life beyond. 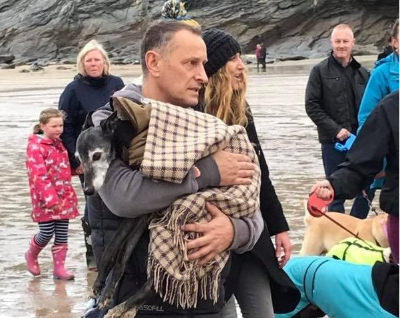 News emerged later that many of those who couldn't make it to Porth Beach took their dogs on walks at 9.30 am in tribute. One attendee rightly commented, "Just look at this turnout. But he's not doing this for publicity; he's doing it because he wants Walnut's final hours to be special." When they reached the water’s edge, Mark gently lowered Walnut onto the sand, allowing him to dip his paw in the water. The two shared a quiet moment. All good things and walks come to an end. When the walk was over, it was time for Mark to put Walnut out of his misery. He drove Walnut to his final destination. In this last journey, Mark would not have the presence of those who had gathered on the beach. Where did the end come? Before he left for Walnut’s veterinary doctor’s clinic, in a quick interview Mark gave an emotional tribute to his dear friend. "He has always travelled around with me, all around London and he stood by the swimming pool whilst I gave diving lessons, we've been in all sorts of bizarre situations together, various girlfriends who have got upset because I always put him before them, I have always put him first and maybe I shouldn't have but he is just such a special dog”. "I got as message from a guy who really put his finger on it, he said how dogs really bring the best out in people, and then people do the best things." Walnut’s end came at around noon. Mark posted a message on Facebook to announce this. Even in his moment of grief, he thanked those who made Walnut’s last walk special. “Walnut passed away this morning at 11.56am. The family and our three whippets, Monty, Nelson and Charlie were also in the room.He went very quickly and in my arms. I am writing this post because I owe it to everyone who has supported myself, my family and most importantly Walnut. Thank you to the hundreds of people that attended the walk this morning and to all those that had their own walks with their beloved pets at 9.30am all around the world. I also want to thank the wonderful people of Newquay for their support which I will never forget as long as I live. I read out a poem that was sent to me by one of the many well-wishers just before Walnut had his last sleep and would love you all to read this as well to remind ourselves just how lucky we are to be alive and to share in the wonderful world that our pets give us. God bless you all”. The poem he referred to is ‘Today you did the bravest thing’ by Debbie Gaskin. It expresses the gratitude of a dead pet (from beyond) towards the owner who had to put the pet down. Today you did the bravest thing, today you set me free. Thank you for showing me the ultimate dignity. I'm sorry that my leaving has broken your kind heart. But we knew this day would come, the day we had to part. Don't think I did not hear every last word you said. Don't think I did not feel your trembling hand touch my head. Who said what on this loss? Support has been pouring in for Mark from around the world. Almost every comment captures the empathy of other dog owners towards Mark’s situation and happiness with the way Mark gave his best friend the ‘best send-off ever’. Many also assured Mark that dogs wait across the Rainbow Bridge for their owners in the after-life. Run free in eternal sunshine Walnut. Mark, you have given your boy the best send off any dog could wish. I think if you truly know and love your animals you know when they have had enough and are ready to go. Doesn’t make it any easier I know. Beautiful. Well done. It's one of the hardest things to do. Grieve and remember he will always be with you. Mark you are a wonderful caring Man, my heart goes out to you and your family, enjoy your well-earned rest now. Walnut over the rainbow bridge your Daddy loved you so much, and you touched the hearts of so many people around the world. R.I.P. Walnut couldn't have had a better family. My heart breaks for you and I hope you find peace in knowing that he's up there with all the other dogs and cats, healthy, whole and happy. And when you get to heaven, he'll be so happy to see you. We will be dealing with a similar loss. Our seven year old Shepherd mix, Django, has bone cancer and he has held on longer than the vet predicted. So, I'll tell my boy Django to keep an eye out for Walnut and they can play together. Bless you. Thinking of you at this sad time. Our own dog, Milo, entered our lives just 2 years ago and I can honestly say that I cannot imagine a time without him. I'm sure that Walnut has had a full and happy life with a family that has loved him as unconditionally as you have loved him in return. Once the tears of his passing fade, you will be able to smile when you think of these last amazing memories you created for Walnut. Note: The Rainbow Bridge is the theme of several works of poetry written in the 1980s and 1990s that speak of an other-worldly place where pets go upon death, eventually to be reunited with their owners. How deep runs the human-canine bond? 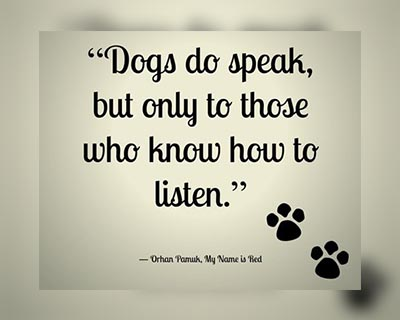 Those who own dogs would often claim that the bond is not just deep, it is sacred. Raising a dog - if you do it properly - is like raising a family. It involves hours of walking and (compulsory) playing, whether it is a cold winter morning or a hot summer afternoon, regular meal times, compromising your vacation destinations and schedules, and of course, frequent visits to the vet. But they love you back. And they never answer you back. They wait for you to come back from work. They become sad when you leave them with others and that makes you sad too. You dress them up for special occasions like you dress up yourself. In fact, it is often argued that a dog’s love is more than the human race deserves. Your dog never judges you for what you look like or for how much you make in a month; he (or she) can understand when you are happy, sad, sick, worried, or just in need of some comfort. This capacity to express affection - unconditionally - itself can qualify the dog to be deemed a valued "family member." Waking a dog is a special routine. That is your quiet time with the dog, away from the mad noise of the whole world.For your dog you are his world. One dog owner, Robin, captured this companionship beautifully through the following story he shared on a pet site.